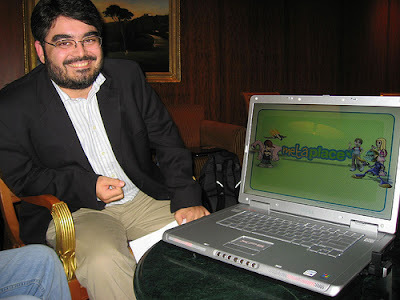 Metaplace, launched by San Diego-based Areae (please find my January post Serious Games: MMOs Raising Millions In Venture Capital), is a site on which amateur designers can create their own games and virtual worlds. The concept may sound familiar; similar ideas are in operation at other networks. Nevertheless, Areae's Metaplace platform wants to revolutionize this area, enabling users to make virtual spaces from simple building blocks. They're doing their best to break down the walls around the currently walled gardens. This is a huge development that could change how we think of virtual worlds. 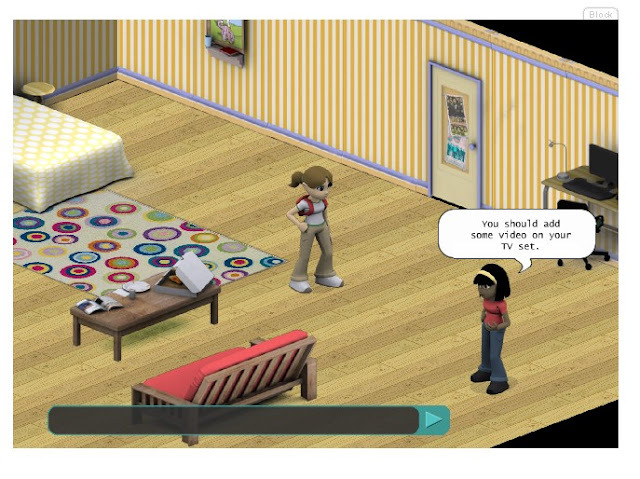 How is Metaplace different from all the other "do it yourself" platforms and such that are in development? "Our goals are sort of idealistic. We think there are all kinds of things on the Internet that would be improved if anyone could have a virtual place of their own. Metaplace allows more diversity. Right now, there are lots of people who want to use virtual worlds for research, or education, or business, but it's just too darn hard to get one going. 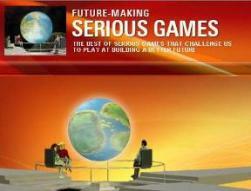 Now you can create a world in just a few minutes and start tailoring it to your needs." Metaplace-created virtual spaces are expected to be robust with users being able to play games, socialize, create content and conduct commerce. They can be embedded into your Facebook page, MySpace page, or your own blog via a flash-based client widget. 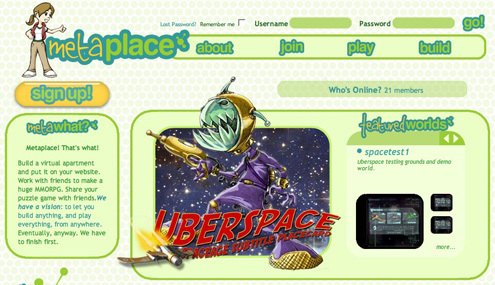 Every world is indexed, tagged and rated by users on the Metaplace portal, so virtual worlds in the Metaplace network can be easily linked together. Each of the virtual worlds can be completely different including virtual apartments for decorating, plazas where readings and musical events happen, space-action games, full-blown MMORPGs, casual games, and Amazon storefronts. 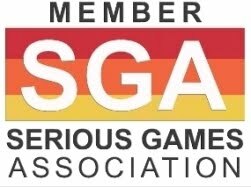 "Back when the original Areae website was launched, we said that we wanted to make virtual worlds work the way the Web does. Looking back, a lot of people assumed we meant that sort of metaphorically. But in fact, we meant it very literally." They've used as many web standards as possible, so you could make a game that was also a website, or a world populated with web data. Even the client can be re-written for whatever platform you want. 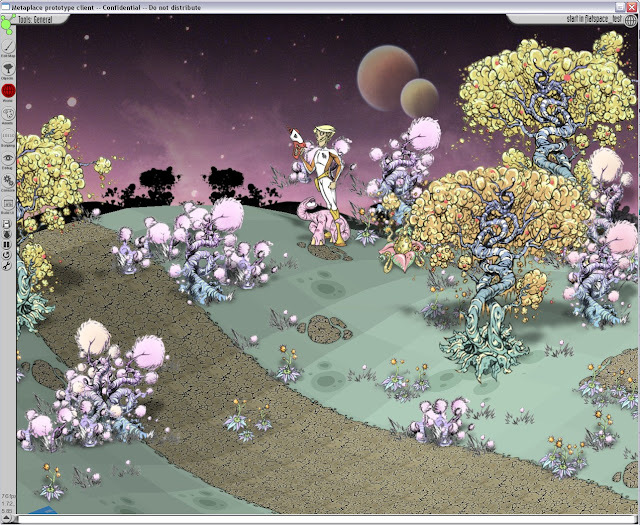 "We knew it was all coming together when one of our team made a game in a day and a half. And then stuck that game on a private MySpace profile. You can inherit someone else's world (if they let you) and use it as a starting point. You can slurp whole directories of art and use them as building blocks. Cut and paste a movement system or a health bar from one world to another. Use an RSS feed for your NPCs. We made puzzle games, RPGs, action games... and set up doorways from one to the other. Basically, coming to work in the morning is a lot of fun." Metaplace has a two-pronged strategy: Coders and designers develop gaming platforms, and users build atop the platforms to invent their own environments. They can pull in games, images and videos from other places. Although quite a few individual games have allowed users to build atop their worlds, Koster hopes that his startup will be able to grow into something exponentially larger. However, big questions remain for this company. Do people really want to mashup their worlds? Other, bigger virtual worlds like Second Life have APIs that give developers and users more options. 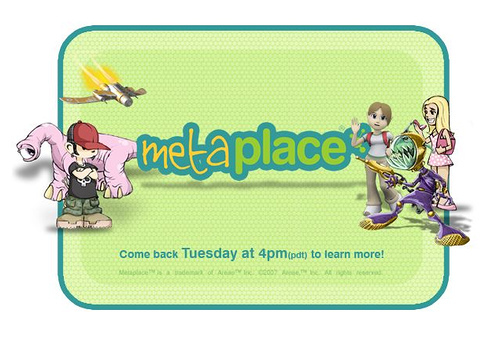 As of its launch late September 2007, Metaplace only has about four different templates for game creation, created by the Metaplace team. The number could someday grow to thousands. With that many designs available, users would have a nearly infinite array of tools at their disposal to create their own games.